News on the Housing front continues to marginally improve. This is not yet a positive number, but it is getting less worse. 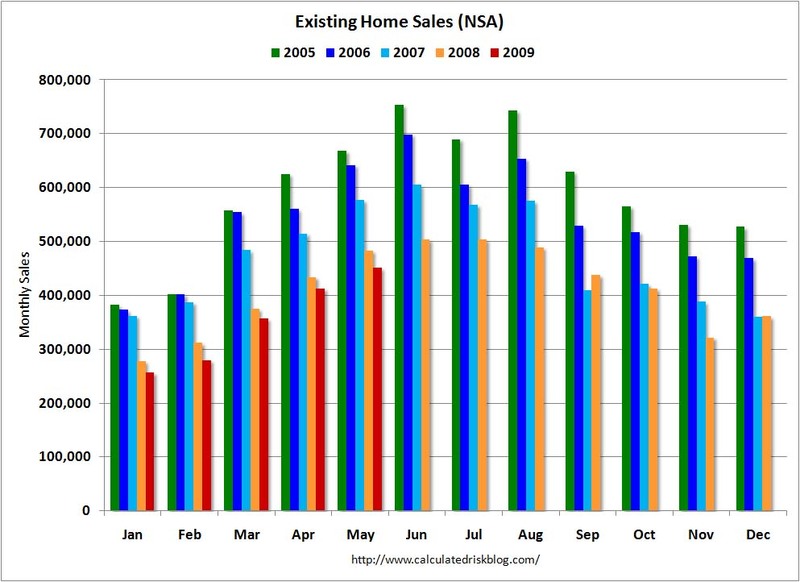 Existing-home sales fell 3.6% from May 2008. Sales in May 2009 rose 2.4% from April to 4.77 million. Note that these are apple and orange comparisons — revised to unrevised numbers. Once again, the prior monthly number was revised downwards (4.68 million down to 4.66 million). • Inventory is a 9.6-month supply at the current sales pace, down from a 10.1-month supply in April. • Median existing single-family home price was $172,900 in May, down 16.1% from a year ago. Consider: The NAR remained notably silent during the appraisal corruption during the boom; Home sales based on loans to people who couldn’t afford them that drove prices higher were fair basis for appraisal comparables — but when these same homes are sold — inevitably through forclosure auctions, REOs or distressed sales — they should be ignored? Only up, not down? Even worse, they seem to be calling for a return to “local” (i.e., friendlier) appraisals — like the good ole’ days. You remember the “friendlier” era of corrupt appraisals that were rife during the credit bubble? Am I reading this correctly? It looks like code for USE APPRAISERS (i.e., CORRUPTIBLE) WHOM YOU KNOW. I thought I was inured to the idiocy of the NAR and the fetid stank of corruption that their press releases come with, but even I am astonished by the filth emanating from their offices today. Shame on you . . .
2 Responses to "Existing Homes Sales Fall 3.6%"
The NAR (National Assocition of Realtors) is a trade association or industry trade group. A trade association’s primary purpose is public relations and lobbying for the interests of the group members. Other examples of trade associations include the AMA (American Medical Association), PMA (Pharmaceutical Manufacturers Association), ADA (American Dental Association), NAM (National Association of Manufacturers), and Business Roundtable. Most media articles about a particular trade association’s interests, such as buying a house or talking to your doctor, are public relations press releases presented as news articles, usually without any source citation.